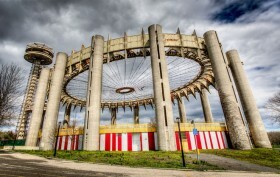 POLL: Should the New York State Pavilion Get a Creative Makeover? 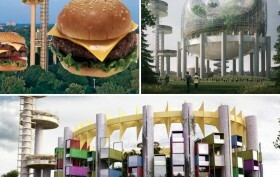 Yesterday, 6sqft shared some of the best and wackiest proposals from an ideas competition reimagining Philip Johnson‘s iconic New York State Pavilion. 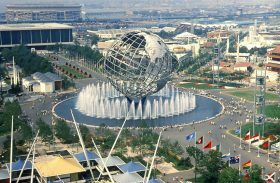 Built for the 1964-65 World’s Fair in Flushing Meadows-Corona Park, it’s struggled in recent years to find financial support, and the competition is a way to drum up enthusiasm for the necessary $52 restoration. 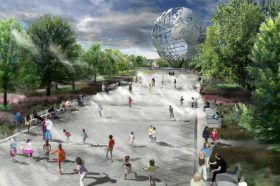 The ideas ranged from the expected (elevated parks, event spaces) to the socially conscious (refugee housing, a homeless shelter) to the totally out there (a cheeseburger museum, a UFO landing pad). 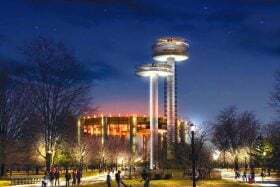 And while a new incarnation for the historic site would certainly draw visitors and interest, is that the appropriate way to honor the cultural and architectural merit of a structure that was built for a specific purpose at a very special point in time? 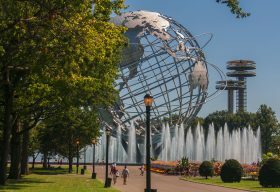 Plus, preservationists have already secured close to $6 million for repairs, and the structure got a $3 million paint job last year. 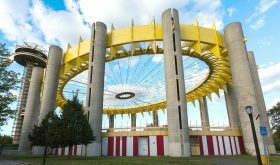 Philip Johnson‘s iconic New York State Pavilion in Flushing Meadows-Corona Park was built for the 1964-65 World’s Fair, but has struggled in recent decades to find its purpose. 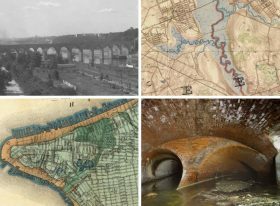 Because of its architectural and cultural merit, however, preservations have made great strides in the past several years: a restoration task force secured $5.8 million for repairs in 2014; it received a $3 million paint job last fall; and now it’s creating quite the buzz thanks to an ideas competition put on by the the National Trust for Historic Preservation and People for the Pavilion (h/t WSJ). 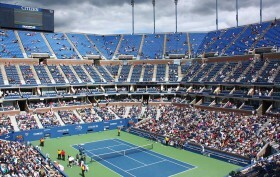 The competition, which organizers hope could help drum up enough enthusiasm to aid in the $52 million total restoration, has drawn more than 250 submission, including wacky ideas like a cheeseburger museum, a giant time-telling machine, and a UFO landing pad to more practical functions like a brewery, hanging gardens, live-work space for artists, and event venues.